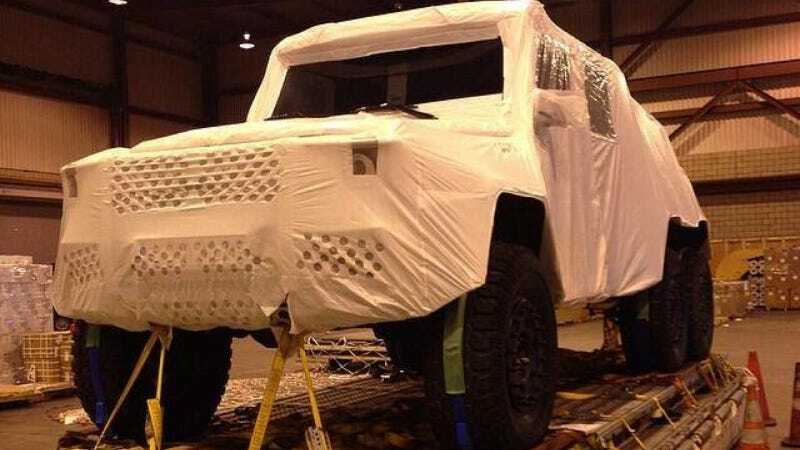 Today we got a sneak peak at one of the vehicles we'll supposedly see in the next Jurassic Park movie "Jurassic World" slated for release next year— a Mercedes-Benz G63 AMG 6x6. This picture from a Jurassic Park 4 Facebook page shows the behemoth Benz under plastic wrap at what the caption says is a warehouse in Hawai'i. I don't think those are googly-eyes on the headlights... but if they are maybe the G-Wagen is playing a dinosaur? Otherwise, it seems like a pretty sweet choice for a prehistoric beast-hunting rig, maybe it will even survive a little longer than the ML SUVs that got demolished in The Lost World. I guess a Ford Raptor was just too obvious of a choice? Image: IMCDb, Jurassic Park 4. Hat tip to Loping Camshaft!